Deadline Slave and MayaBatch are child processes of Deadline Launcher, and so they inherit their environment from their parent process (deadlinelauncherservice). If you don’t restart the Launcher, it won’t have the new environment, and neither will child processes like the Monitor or MayaBatch. Restarting the service will restart the child processes too. However, if you didn’t install the Launcher as a service, it is slightly more complicated. When you exit and restart the Launcher, the child processes may end up as “orphans” with the same old environment, and you’ll have to restart them too. 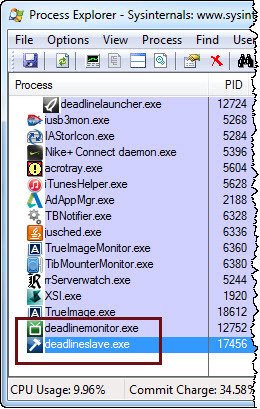 In the screenshot below, Deadline Monitor and Deadline Slave were child processes of Launcher, but when I exited Launcher they kept running. This entry was posted in Tips, Troubleshooting and tagged ArnoldRenderer, Deadline by xsisupport. Bookmark the permalink.